John R. Hibbing, Kevin B. Smith are professors of political science at the University of Nebraska-Lincoln. John R. Alford is a professor of political science at Rice. 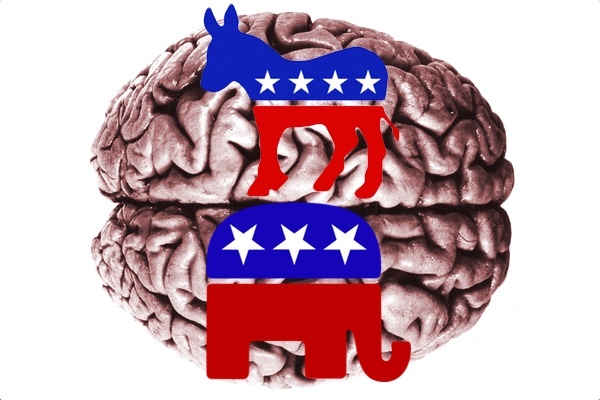 They are the authors of Predisposed: Liberals, Conservatives, and the Biology of Political Differences. At one level, the course of history seems driven by idiosyncratic events and personalities. Yet at another, amidst all the apparent unpredictability, recognizable patterns of conflict consistently reappear. The most important of these recurring cleavages separates the political left from the political right. The terms left and right may or may not have originated earlier than revolutionary France but it is certain that, as Emerson notes, “the party of conservatism and that of innovation have disputed the possession of the world ever since it was made.” Emerson goes on to suggest that these primal differences likely have “a depth of seat in the human condition.” We could not agree more. In fact, the central purpose of our research, which we summarize in a recent book, has been to document the deeper bases of this fundamental ideological distinction. Those with greater biological sensitivities naturally are more likely to favor political and social structures that are thought to offer protection. They gravitate toward the traditional and the certain and away from the unproven and novel. On the other hand, those who are biologically less affected by negative stimuli and situations are more likely to be supportive of social and political arrangements that welcome new and untried approaches. Of course, there are also those who fall in the middle of this physiological responsiveness spectrum just as there are plenty of people who are either politically indifferent or middle-of-the-road. No matter whether the physiological test employed is electrodermal activity (skin conductance), eyetracking (to identify people’s patterns of directed attention), subthreshold muscle movements, or brain activation patters (as measured by magnetic resonance imaging), multiple labs in multiple countries consistently find a relationship between political beliefs and physiological response to disgusting, threatening, or simply disquieting aspects of life. Conclusions such as these are easy to misconstrue. For example, they do not mean that, as Rogers and Hammerstein suggested, “every boy and every gal that is born into the world alive is either a little liberal or a little conservative.” Recent evidence does indicate that political tendencies are in part genetic but that same evidence also indicates an important role for environmental events. Just because individuals display relatively consistent biological tendencies does not mean those tendencies are entirely genetic. Environmental forces can also lead to biological instantiation, especially if they are searing or oft-repeated. Moreover, these conclusions do not mean that every political issue-of-the-day springs from biological differences. To take one example positions on economic issues such as taxation and government spending do not seem to be tied as tightly to physiological patterns as social issues are (such as immigration and gay marriage). Finally, none of this is to say that historical events and the way elites and the media frame issues are irrelevant. Quite the contrary. Those who are physiologically sensitive to negative situations may favor isolationism or they may favor interventionism depending upon the particular context (pre- or post-Pearl Harbor) and depending upon the arguments of leaders such as Charles Lindbergh, Robert Taft, or Barry Goldwater; however, relative to those who fail to give evidence of strong physiological responses in the face of negativity, they are consistently more concerned with security in the face of outside threats. In other words, those who are sensitivity to negativity can be channeled in different specific policy directions but they will always be more persuaded by arguments that the direction in question will lead to greater security and less susceptibility to the powers of groups other than their own. Those with stronger physiological responses to unpalatable situations are more likely to favor defense spending, less likely to favor open immigration politics, and more likely to view with suspicion external entities, such as the United Nations and the European Union. Issues may come and go, inter-racial marriage may be replaced by gay marriage and soon gay marriage may be replaced by something else, but the type of person who is consistently more bothered by departures from the traditional way of doing things will continue to possess a particular physiological signature compared to those who embrace the nontraditional. We know from personal experience that people are eager to use these findings as evidence that one group of people is more flawed than another—that, for example, conservatives or liberals have now been shown to be biologically deficient. Politics being what they are, this is not surprising; nonetheless, perhaps it is time to recognize that political differences are not simply the result of one side of the spectrum being uninformed, mentally inferior, or morally bankrupt. Rather, they are the result of deep-seated biological and psychological differences that extend well beyond politics. Those who practice violence or intolerance should never be excused but it could be that political understanding will be furthered by recognizing that those who merely harbor different political preferences than we do may do so because of deep-running biological differences that are not easily changeable. People generally believe that if others were of good heart and sound mind and were exposed to full information, then they would agree with us. This is simply not the case. People are different; they experience the world differently; they do not see, feel, and sense identical stimuli in the same way. Perhaps furthering an appreciation for these basic differences and recognizing that there is nothing inherently wrong with being either more or less physiologically sensitive to danger would soften the edges of political disputes that are so detrimental. It takes nothing away from the fascinating twists and turns of history to note that they overlay a more general pattern. In fact, doing so provides a baseline from which to try to understand that which would otherwise be deeply confusing. The battles between innovation and tradition, between stability and progress, will be enduring because people will continue to differ in the biological traits that fuel these conflicting desires.